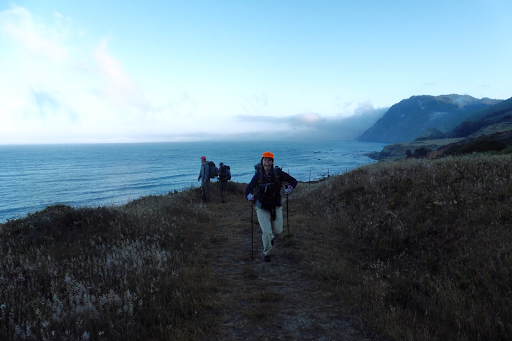 We knew this southern section was the lesser traveled of the Lost Coast Trail, but we thought it was more because of the challenging elevation changes and remoteness of the trailhead. Nope, we now know that it’s because the trail is really overgrown and combined with the ups and downs, the effort does NOT match the reward on this one. Even with absolutely perfect weather, we are all having trouble thinking of anyone that we’d recommend this southern section to. I just think most would not enjoy it, but I also wonder if we just had overly high expectations. We started out the morning walking on a wide open dirt road and great views of the ocean with just a bit of fog in the distance. 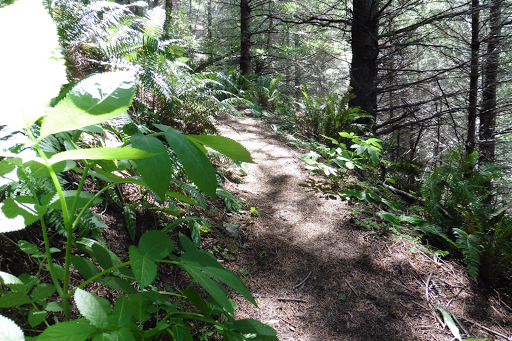 The hiking was nice in the early morning with the dirt road to walk along. 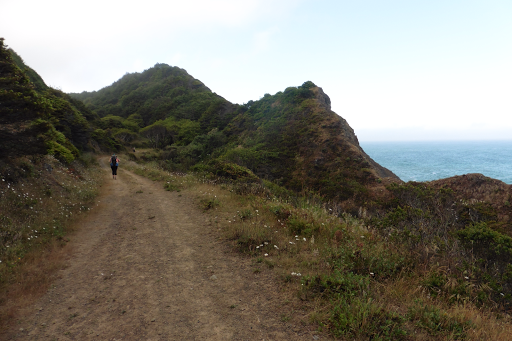 It would wind behind some of the hills and then back out to views of the ocean. Very enjoyable and what I had hoped for on this trail. I now see why people do not do this southern section. This brush really wore on us. It was there almost all day. You can see it was head high in many places. 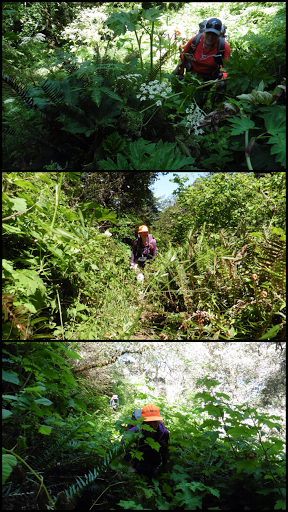 In there was stinging nettle, very high thorny thistle, thorny berries, and the oh so wonderful and unavoidable poison oak. We knew there might be some brush, but not to the extent that we were in it. It really seemed to be half of our 21mi today. Oh, did I mention that there were ticks too!? I really was laughable given what we expected and the stark contrast to what we were in. We got one really nice view early on, but the rest of the way stayed pretty inland away from viewpoints. This is the view along Anderson Cliff. Here is a shot of a moment of clear trail that I completely love! I just had to take a picture of it to remember it was there since it’s the overgrown parts we all remember. 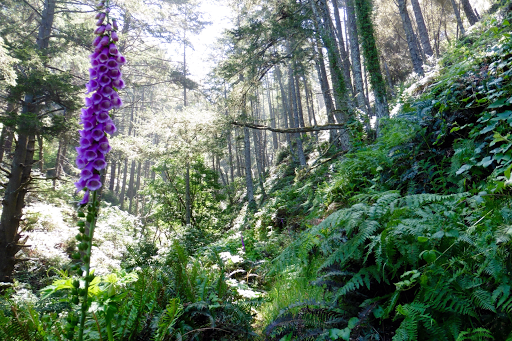 Towards the end, we broke out of the woods and could see our final destination of Usal Beach ahead. It was getting hotter and we were all pretty wiped from the bushwhacking. 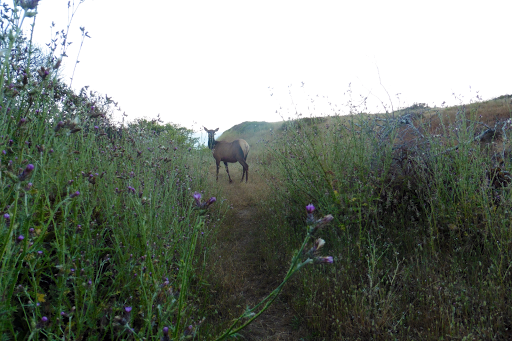 We got some clear trail for a moment and hoped we might cruise…NOPE! It was the worst of the day in the last four miles or so to the trailhead. A lot of the final miles had the head high thistle again. Pushing through this thorny stuff with very fine needles that get in your skin…I’m not over exagerating here. It was not enjoyable. We kept joking that this stuff was not in the brochure, ha! When we made it to Usal Beach Campground around 6pm, we set up a celebratory dinner next to a creek and all took a communal Technu bath in hopes of getting the poison oak off of us. We all are contemplating burning the clothes we wore and just put them in bags to deal with sometime after we get home. I even washed my poles best I could and will have to do the same with my pack. 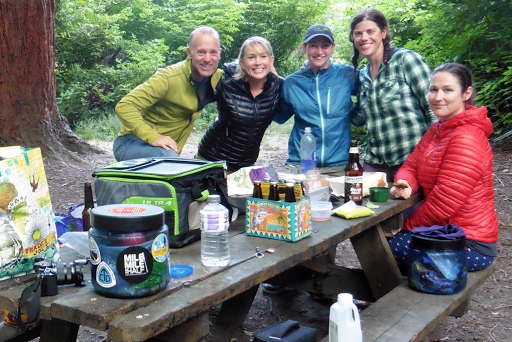 Even though the trail was a bit of a bust, we all enjoyed being together again and we ate all the organic junk food Rockin’ and Dan had in their car…a bag of chocolate chip cookies, 2.5 bags of potato chips with peach salsa, and dolmas. It was the oddest mix of things and we all just scarfed it down. 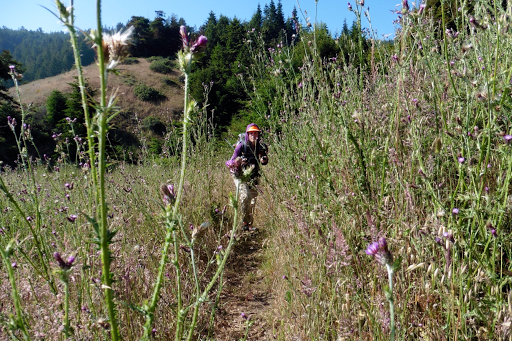 If I haven’t been clear, my final thoughts on the Lost Coast Trail is that it’s a lot of effort to make for an overhyped trail. 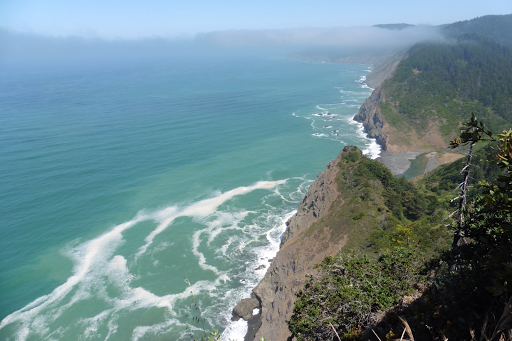 Yes, it’s nice to hike along the ocean, and there is a good stretch of ~25mi to hike at the Lost Coast, but we all agree that you can see the same thing walking along many beaches in California. 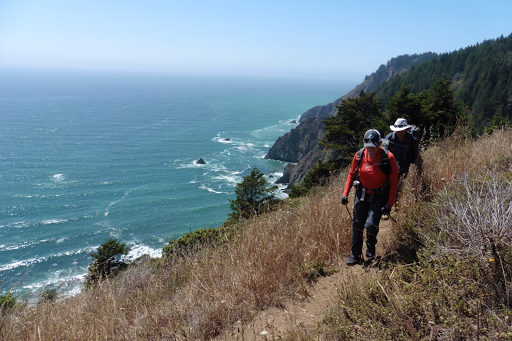 My suggetion is to go to the Olympic Coast, West Coast Trail, or Oregon Coast for some great ocean hiking. All have shuttles and logistics to deal with, but they are worth doing! I heard the brush we went through might be abnormally high this year, but I can’t recommend the southern half. We honestly said we’d think that stretch is what you’d take a first time backpacker on if you wanted them to never backpack again, ha! I don’t say this to be harsh, but I am just upset no one gave me a heads up. I believed the hype from when Backpacker Magazine featured it many years ago and wish someone would have warned me so we all could have gathered for something else. Hey, they can’t all be winners and it was just great to be with this group and we still had fun and laughed most of the way through. Myself, Rockin, and Dan all decided to drive out to sleep in beds. They drove to a hotel and I am staying with hiker and gear aficinado John Abela from hikelighter.com. I didn’t get there almost 10pm and stayed up til midnight showering and doing some final blog stuff. Man, what a day, whew! 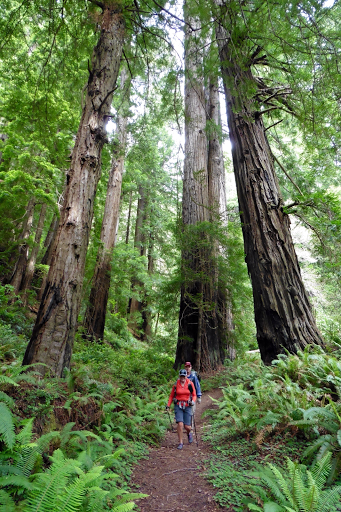 Tomorrow, John is taking me, Rockin, and Dan to the Redwoods for some sites and I’ll go there for two days before I drive home to Portland for a week (can’t wait to REST!). Then it’s off to Montana for some hiking on the CDT and then the Great Divide Trail starting July 6th. I’ll be posting on the Redwoods in a couple days. 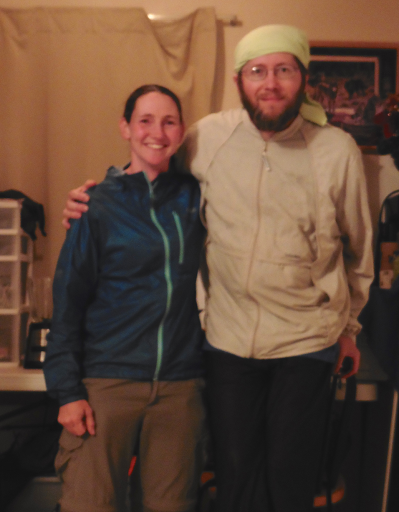 THANKS to John for hosting me in Eureka! That’s an ambitious first trip! Did you like it? 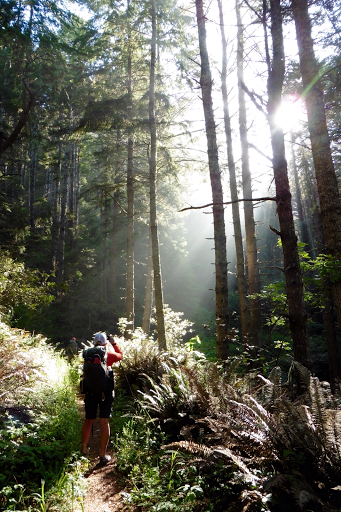 Well, it was one of my very first wilderness experiences on the west coast, so I loved it! We didn’t make it very far up the beach because we had no idea how hard it was going to be to walk in sand with heavy packs. We didn’t have any truly lightweight gear. My boyfriend was carrying a jansport style school backpack and had a car camping rectangular sleeping bag strapped onto the bottom of it with a belt! I borrowed a pack from a friend that did lots of trail maintenance work and it probably weighed 6lbs on its own. I’m guessing we maybe walked 8 miles up the beach before calling it quits and stopping for the night. hahaha.